Providing you the best range of industrial chiller, air cooled industrial chillers and industrial water chiller with effective & timely delivery. Industrial chillers are classified as a refrigeration system that cools a process fluid or dehumidifies air in commercial and industrial facilities. A chiller will use either a vapor compression or absorption cycle to cool. Chilled water has a variety of applications from space cooling to process uses. 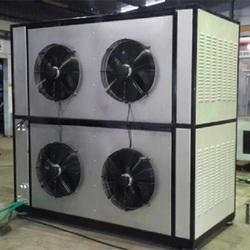 A chiller is rated between one to 1000 tons of cooling energy. air, water and evaporative condensed chiller. The first three types are mechanical chillers which are powered by electric motors, steam, or gas turbines. An absorption chiller is powered by a heat source such as steam and uses no moving parts. The evaporator in the chiller will operate at a lower pressure and lower temperature than the condenser. 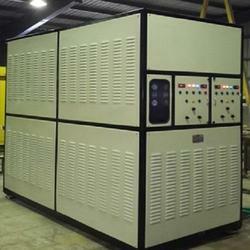 As a leading firm, we are involved in manufacturing and exporting as large gamut of Industrial Chillers. The materials we use in fabrication of these chillers have been selected from some of the well known and authentic vendors of the industry; possess rich industry experience and vast knowledge of their respective domains. Moreover, our safe packed range of products is delivered within the given time span. The chillers we offer are designed to perfection under the guidance of our skilled engineers who possess rich experience in this domain. Chillers range of the latest version of the original circulating system. Designed to fit into tight spaces, it provides accurate dependable control for your process applications and utilizes less floor space. The Most important feature of this chiller is, it is without a storage tank and the media to be cooled is chilled Directly due to a specially designed SS evaporator. Available in Air-Cooled and Water-Cooled models. Having a temperature range from 10° C to 20° C.
Chillers features Non-Corrosive components in both the refrigeration and fluid handling circuits. Combined with a durable supply pump, and Stainless Steel Evaporator. To ensure Precise process Fluid Temperatures a Microprocessor based Temperature Controller is standard on the 1 Ton to 3 Ton chillers. Well-designed, easy to operate, in built Control Panel incorporating fuses, Switchgears, LED displays for Fault Detection is a standard feature in the full range of chillers. 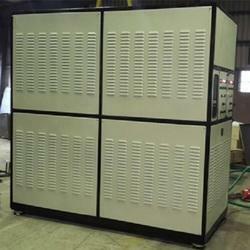 We are operating as the manufacturer Industrial Chillers. 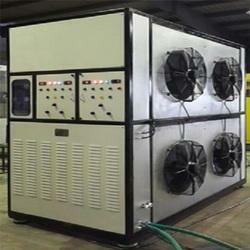 The offered chiller is used for maintaining the working temperature of the environment in multiple industries. It is impeccable in terms of quality and is made from high quality materials in a sophisticated manufacturing facility. We are well-equipped for handling bulk orders owing to our spacious warehousing unit.